Kluhsman Racing Components (KRC Racing) has a wide range of hardware, parts and tools for racing ranging from power socket wrench kits, inline fuel filters, quick-disconnect throttle linkage kits, carburetor dust cover assemblies, carburetor linkage bushings, transmission shifters, fuel filter housings and hundreds more products. KRC Racing 1045 Carburetor Bushings Sold as Pair and made of aluminum. .250 inch inside diameter and .625 outside diameter. KRC Racing 1049 Gas Pedal Ball Kit is designed to fit the KRC Racing 1040 quick-disconnect throttle rod. The KRC Racing throttle ball accessory kit fits the KLU-1040 throttle linkage and easily allows you to hook up your linkage to your carburetor. KLU-8219 Double angled stud chaser with 5/8-11 coarse threads to help you in the shop or at the track. KLU-8220 Double angled 5/8-18 fine thread stud chaser to help you repair threads in the shop and at the track. KRC Racing 1051 Throttle Linkage Rod, 22" Length, made of aluminum. 3/8 inch -24 thread. KRC Racing 1046 Carburetor Return Spring Kits, made of lightweight aircraft aluminum with dual spring and bracket included. Achieve smoother more consistent throttle application with the KRC return kit. Attached spring to intake with mounting plate to eliminate rotating past center of throttle shaft. KRC Racing 1043 Throttle Ball Accessory Kit for Sprint Cup, 1/4 inch ball with 7/8 inch stud length. KRC Racing 1038 Adjustable Pedal Stops, Adjustable travel up 2 1/4 inches. KRC Racing 8212 Lug Nut, 45 Degree, 5/8 Inch x 11 RH, Set of 20. These lug nuts are made of steel with a zinc plating featuring an open end design with conical seat. KRC Racing 8213 Lug Nut, 45 Degree, 5/8 Inch x 11 RH, Set of 20. These lug nuts are made of steel and are zinc plated with an open end design and conical seat. KRC Racing 1077 AN to NPT Hose Adapter Fitting, 1 3/8 Inch Male to -20 AN. KRC Racing 8204 Lug Nut, 45 Degree, 5/8 Inch x -18 RH, Set of 20. These lug nuts are made of steel, with an open end and conical seat. KRC Racing 8215 Lug Nut, 45 Degree, 5/8 Inch x 18 RH, Set of 20. These lug nuts are made of steel with a zinc plating featuring an open end design and conical seat. KRC Racing 8213T Lug Nut, 45 Degree, 5/8 Inch x 11 RH, Set of 20. 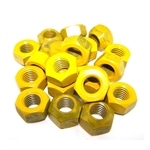 These lug nuts are made of steel and have a yellow PTFE coating on them with an open end design and conical seat. KRC Racing 8211 Lug Nut, 45 Degree, 5/8 Inch x 11 RH, Set of 20. These lug nuts are made of aluminum and feature an open end design with conical seat and are black in color. KRC Racing 8202 Lug Nut, 45 Degree, 12mm x 1.25 Inch, Set of 16. These lug nuts are made of aluminum, are open ended, black in color and have a conical seat. KRC Racing 8203 Lug Nut, 45 Degree, 12mm x 1.50 Inch, Set of 16. These lug nuts are made of aluminum, black in color with an open end and have a conical seat. KRC Racing 8205 Lug Nut, 45 Degree, 5/8 Inch x 18 RH, Set of 20. These lug nuts are made of aluminum with an open end design and conical seat. KRC Racing 8206 Lug Nut, 45 Degree, 5/8 Inch x 18RH, Set of 20. These lug nuts are made of aluminum, black in color and are open ended with a conical seat. KRC Racing 8209 Lug Nut, 45 Degree, 1/2 Inch x 20 RH, Set of 20. These lugs nuts are made of aluminum, black in color featuring an open end design and conical seat. KRC Racing 8210 Lug Nut, 45 Degree, 7/16 Inch x 20 RH, Set of 20. These lug nuts are made of aluminum, black in color and feature an open end design and conical seat.